Een lekkernij voor degenen die van echte 'Old time Louisiana French- Creole Country Music' houden. Deze drie vrienden brengen ons meer dan 50 jaar terug naar de tijd voor de Zydeco zijn intrede deed. The Cajun trio of Cedric Watson, Ed Poullard, and James Adams is an authentic link to the myriad bands that performed folk and dance music throughout Louisiana during the 20th century. Here they combine traditional and modern tunes in a lively set of fresh-sounding recordings. Old-time Creole la-la music was pushed aside by the advent of zydeco some time ago. Luckily, the rural, acoustic Creole house party music never totally died out but managed to keep re-blossoming, in part thanks to stalwarts like Ed Poullard, James Adams and the Pine Leaf Boys’ Cedric Watson. While their impetus for establishing a formal group was directly due to their collective musical kinship and devotion to the repertoire, symbolically it runs deeper than that. 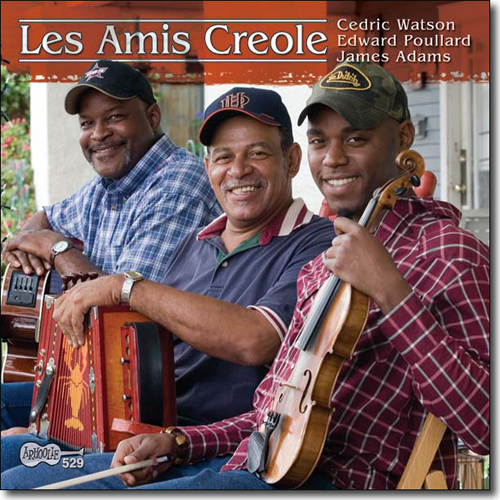 Each of the three are modern day keystones of an interlocking puzzle: Poullard with his music-playing family and countless gigs with fiddle legend Canray Fontenot and the Ardoin family, Adams, who discovered his culture late in life; and Watson, the young buck Creole fiddler everyone thought didn’t exist. Like the la-la parties in the Poullard family kitchen, Les Amis Creole gathered in the kitchen of the Pine Leaf Boys’ abode with Joel Savoy behind the controls. With Poullard’s pulsating, full-bodied accordion playing and seemingly perfect tonality, Watson’s prancing bowing and searing high notes and Adams’ driving guitar rhythms, they play invigorating, old-style acoustic dance music just as their forebears did. While they draw heavily from the Ardoin-Fontenot musical canon, they also show the tightly coupled nature of Creole-Cajun music with selections from Cajuns Dennis McGee, Sady Courville, Ambrose Thibodeaux and Dewey Balfa. Poullard reveals that his family had a musical tradition as well by unveiling two of his father’s tunes, the euphoric “The Poullard Special” and “L’Hobo De Breaux Bridge.” “Valse A Alcee Poullard” would appear to be another family tune, but the shared surname is a coincidence; the song was learned from the recordings of Amédé Ardoin who waxed it in 1930 with Dennis McGee. Additionally, there are a few sublime Watson-Poullard fiddle duets and two more tune showcases Poullard’s masterful solo technique on accordion. Overall, the album is essential listening, especially for those interested in the difference between zydeco and old-time Creole la-la music. The distinction couldn’t be better made than right here. “Les Amis Creole have passionately absorbed and invigorated the homespun music of their ethnic heritage. In so doing, they take us back to an era before the advent of zydeco – to a time when their people first propagated a danceable folk idiom at ‘la-la’ house parties across southwest Louisiana.